Or maybe you're just a mom or dad and you have this nagging feeling that your kids are street racing your new Lexus when you aren't looking. The only problem with both of the above scenarios is that it can be hard to prove either of them without spending a lot of time and effort hiring a private detective to follow your folk around. Or possibly a psychic. Until now, of course. Thanks to a high tech little thingy from Davis Instruments, of Hayward, California, you can now monitor what's being done with - or to - your vehicles when they're out of your hands. 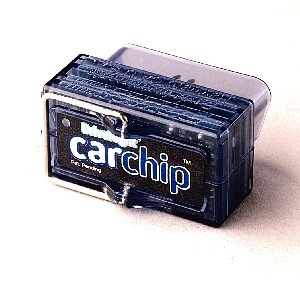 It's called the CarChip - not to be confused with a cow chip - and it's a removable little black box-like gadget that not only keeps track of your vehicles, it'll give you printouts you can shove under your car-abusing knaves' noses to force them into a tearful confession guaranteed to bring a human rights complaint against you. The CarChip is only a couple of inches square and is supposed to work on any vehicle after about 1996. It plugs into something called the onboard diagnostic port, which is usually under the dash board, and it tracks such parameters as trip duration and distance, speeds, engine rpm's, and even instances of heavy acceleration or braking. It'll store up to 75 hours of trip details and you can program it to monitor multiple drivers. My personal cars are too old to take the CarChip, which really threw a monkey wrench into my plans for testing the device. But I'm a parent, fortunately for my testing purposes if not for my kids, so I got one of my sons to try it in his 2000 Honda Prelude SH. He drove around for a couple of weeks with the CarChip installed, and because it parks out of the way below the dashboard he tended to forget it was there. This makes me believe I got an accurate picture of his driving habits. I should never have let him get his driver's license! When he returned the CarChip to me and I plugged it into my PC afterward and downloaded the data, the first line of the printout begged in huge red letters and bold face type that I never force it to drive with my son again. Okay, I'm kidding about that, but by reading the graphs the Chip's software draws up I could really follow his individual trips from start to finish, from when he'd peel out from one red light to where he'd jam on the binders at the next one. I felt sorry for the other people on the road! I jest, of course. My son is a very good driver, but he does tend to be a tad aggressive behind the wheel at times (and I have no idea where he inherited that! ), which means he actually turned out to be an excellent tester for the CarChip's capabilities. The CarChip can do a lot more than just give you a printout of the points at which your poor car's tires received the most abuse. It can also track your vehicle's coolant temperature, oxygen sensor and more. You could even use one to monitor your speeds, then proffer a printout in court when you protest the speeding citations. Not that anyone would ever do that, of course. It can also create an accident log that outlines the last 20 seconds of a trip before the big crunch happened.
. Basic CarChip: tracks 75 hours of trip details, including time and date, distance, speed, idle time, hard accelerations and decelerations, and engine diagnostic trouble codes. . CarChipE/X: tracks 300 hours of details. All the features of the standard CarChip, plus an accident log and the ability to monitor any 4 out of 23 user-selectable engine parameters. . CarChip E/X with Alarm ups the ante over the EX and adds an audible alarm that warns a driver when he or she exceeds pre-set speed, acceleration or braking limits. Fleet versions are also available that use Davis' Fleet Management Software that includes even more reporting capabilities.